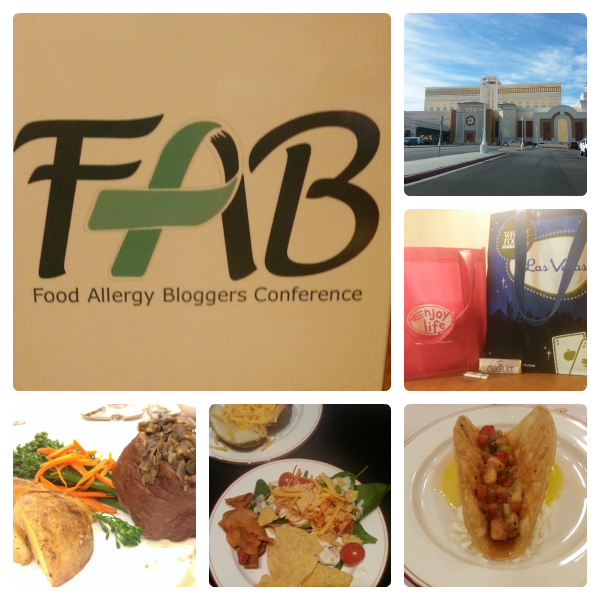 This past weekend I had the opportunity to travel to my first ever blogging conference, the Food Allergy Blogger’s Conference, in Las Vegas. This is the first of a hopefully annual conference that gathered together about 80 allergy or gluten-free bloggers from around the nation. It was so fun to just get away for the weekend and join other gluten-free or allergy bloggers and companies. I wasn’t sure if I should post about it, but I feel like I met some great people with really helpful blogs that I want you to find as well! I hope you’ll take a few minutes to check out some of these great bloggers that I link to, and add them to your blog reader or follow them on social media. First I have to give a quick shout out to the hosting hotel, South Point Hotel & Casino. They did an excellent job at providing safe food for all of the meals. This was a huge undertaking, as not only were there many celiacs there, there were many in attendance with severe (anaphylactic) allergies. In the collage above, you can see a little glimpse of some of the great meals we had including a perfectly cooked filet with mushrooms, and seriously the best broccoli I’ve ever had in my life. I was wishing for seconds on the broccoli, truly. I even got to make my own salad at a salad bar for the first time in years, as every item at the salad bar was gluten-free and clearly labeled with all ingredients, and of course everyone in attendance understood the hazards of cross-contamination. In the left photo above, I am pictured with Charissa from Zest Bakery. If you ever find yourself in the Bay Area, make sure you stop by Zest Bakery for some amazing gluten-free treats. I’ve been following @zestbakery on Instagram for a while, and am always drooling over the photos of everything from doughnuts to amazing cakes, so I was a little starstruck when I met Charissa. She was so fun and I loved talking with her about recipe development and also playing some intense Bananagrams late at night! 🙂 In the middle picture is a new blogger, Wendy from Allergy Free Kitchens. Wendy just started her blog about 2 months ago and has already posted some very yummy looking pictures of gluten & dairy-free recipes. In the right photo, I’m pictured with Daniella from the website Smart Allergy Friendly Education. Daniella lives in the same town as me, yet we had never met each other and didn’t know about each other prior to this weekend! I enjoyed getting to visit with her and look forward to working with her in the future. While everything she posts isn’t gluten-free, some of it is, and she has a lot of great information relating to other food allergies that would be helpful to those of you dealing with those. In the left photo above, I’m pictured with Mary Fran, the amazing baker and web designer of the gluten-free recipe blog frannycakes. When I look at the photos on Mary Fran’s blog, I want to reach through my computer screen to grab myself a cupcake! 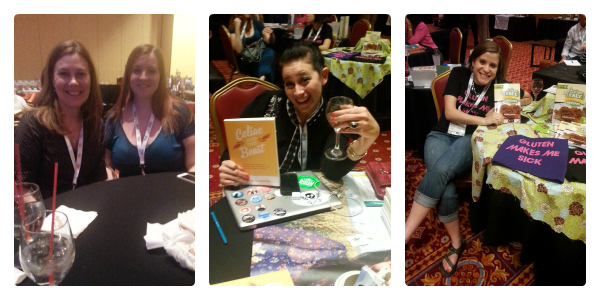 In the middle photo, I’ve got the always fun Erica of Celiac and the Beast with her new book and her wine! I just got my copy of her book, Celiac and the Beast: A Love Story Between a Gluten-Free Girl, Her Genes, and a Broken Digestive Tract , and am looking forward to reading it soon. I’ll post a review when I’m done, but have already heard from so many people that it is very funny! Erica also posted a recap of the Food Allergy Bloggers Conference, including a video where I make a little appearance, which I was so nervous for! In the right photo is my new friend Pam from the blog I’m A Celiac. I happily snatched up one of the fun shirts she sells and her cookbook too! You can buy your own from the store section of her site too. 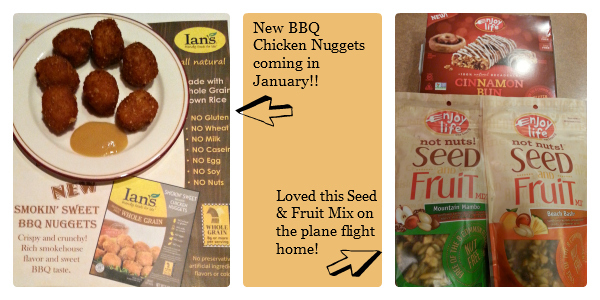 I also enjoyed great products from some of the sponsors, including Ian’s and Enjoy Life Foods. I haven’t even had a chance to try everything in my swag bags yet, so I look forward to discovering more products that are new to me. 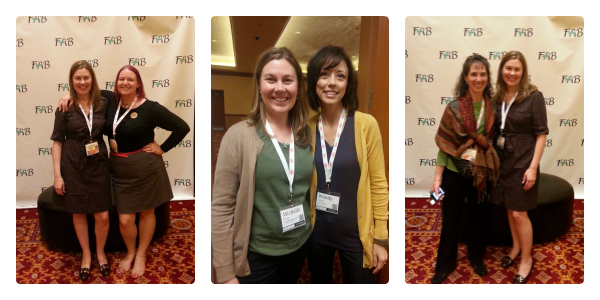 A huge thank you to all of the companies that sponsored the 2013 Food Allergy Bloggers Conference! « Happy Halloween- Stay safe and gluten-free! What was it about the broccoli that made it so special? I like broccoli anyway but am curious! Sounds like the event was a lot of fun. I hope that it does become annual and that I get to make it there one of these years. When I looked at the ingredients, it seems like they seasoned it like I do the asparagus I like – with olive oil, sea salt and pepper. I couldn’t tell how it was cooked though. It was perfectly cooked and the flavor was excellent. Love this recap and am so glad to hear you were able to enjoy the salad bar – it is nice not to worry about food even if it is just for a little while. Thank you for sharing! Thanks Homa! You did a great job with putting this conference on! There is very little I’d wish to change, and I’m really hoping it happens again next year! Great to meet you in Vegas! Let’s do it again! Yes Pam! Hope we run into each other at another event or conference soon! It was a treat (literally!) to meet you. Thanks for this wonderful recap, and I so look forward to continuing to follow your adventures. Take care! I so enjoyed meeting you and sitting by you at some of the meals. You are a fun person to be around and made me feel so at ease as someone that was nervous about being at an event where I didn’t know anyone. I really hope our paths cross again soon!